Physical exam and history: An exam of the body to check general signs of health, including checking for signs of disease, such as swollen lymph nodes in the neck or anything else that seems unusual. The medical doctor or dentist does a complete exam of the mouth and neck and looks down the throat with a small, long-handled mirror to check for abnormal areas. A history of the patient's health habits and past illnesses and treatments will also be taken. CT scan (CAT scan): A procedure that makes a series of detailed pictures of areas inside the body, taken from different angles. The pictures are made by a computer linked to an x-ray machine. A dye is injected into a vein or swallowed to help the organs or tissues show up more clearly. This procedure is also called computed tomography, computerized tomography, or computerized axial tomography. Endoscopy: A procedure to look at organs and tissues inside the body to check for abnormal areas. An endoscope is inserted through an incision (cut) in the skin or opening in the body, such as the mouth or nose. An endoscope is a thin, tube-like instrument with a light and a lens for viewing. It may also have a tool to remove abnormal tissue or lymph node samples, which are checked under a microscope for signs of disease. The nose, throat, back of the tongue, esophagus, stomach, voice box, windpipe, and large airways will be checked. The type of endoscopy is named for the part of the body that is being examined. For example, pharyngoscopy is an exam to check the pharynx. Laryngoscopy: A procedure in which the doctor checks the larynx (voice box) with a mirror or with a laryngoscope. A laryngoscope is a thin, tube-like instrument with a light and a lens for viewing. Oral brush exam: A procedure in which the medical doctor or dentist uses a small brush to remove cells that may be cancer. The cells are checked under a microscope for signs of disease. HPV test: A laboratory test used to check the sample of tissue for certain types of HPV infection. 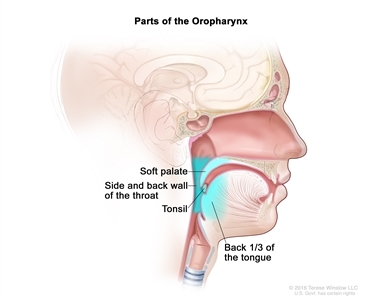 This test is done because oropharyngeal cancer can be caused by the HPV virus. Whether the patient has a history of smoking for more than ten pack years. Surgery (removing the cancer in an operation) is a common treatment of all stages of oropharyngeal cancer. A doctor may remove the cancer and some of the healthy tissue around the cancer. Even if the doctor removes all the cancer that can be seen at the time of the surgery, some patients may be given chemotherapy or radiation therapy after surgery to kill any cancer cells that are left. Treatment given after the surgery, to lower the risk that the cancer will come back, is called adjuvant therapy. 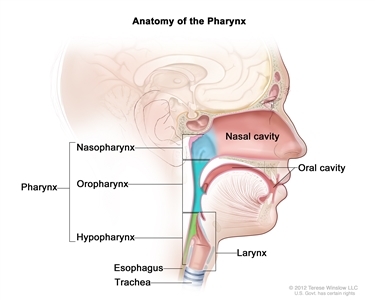 New types of surgery, including transoral robotic surgery, are being studied for the treatment of oropharyngeal cancer. Transoral robotic surgery may be used to remove cancer from hard-to-reach areas of the mouth and throat. Cameras attached to the robot give a 3-dimensional (3D) image that a surgeon can see. Using a computer, the surgeon guides very small tools at the ends of the robot arms to remove the cancer. This procedure may also be done using an endoscope. In oropharyngeal cancer, dividing the daily dose of radiation into two treatments improves the way the tumor responds to treatment. This is called hyperfractionated radiation therapy. Radiation therapy to the thyroid or pituitary gland increases the risk of hypothyroidism (too little thyroid hormone). A blood test to check the thyroid hormone level in the body should be done before and after treatment. Cetuximab is a type of monoclonal antibody that works by binding to a protein on the surface of the cancer cells and stops the cells from growing and dividing. Check the list of NCI-supported cancer clinical trials that are now accepting patients with stage I oropharyngeal cancer. For more specific results, refine the search by using other search features, such as the location of the trial, the type of treatment, or the name of the drug. Talk with your doctor about clinical trials that may be right for you. General information about clinical trials is available from the NCI website. Surgery followed by radiation therapy. Chemotherapy also may be given at the same time as radiation therapy for patients at high risk for the cancer to come back. 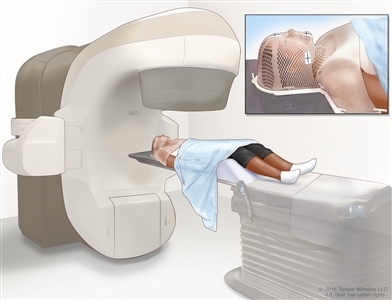 Radiation therapy given at the same time as targeted therapy. A clinical trial of surgery followed by radiation therapy and targeted therapy. A clinical trial of transoral robotic surgery followed by radiation therapy with or without chemotherapy. Check the list of NCI-supported cancer clinical trials that are now accepting patients with stage III oropharyngeal cancer. For more specific results, refine the search by using other search features, such as the location of the trial, the type of treatment, or the name of the drug. Talk with your doctor about clinical trials that may be right for you. General information about clinical trials is available from the NCI website. Surgery followed by radiation therapy. Chemotherapy also may be given at the same time as radiation therapy to patients at high risk for the cancer to come back. A clinical trial of chemotherapy followed by surgery. A clinical trial of transoral robotic surgery. Check the list of NCI-supported cancer clinical trials that are now accepting patients with stage IV oropharyngeal cancer. For more specific results, refine the search by using other search features, such as the location of the trial, the type of treatment, or the name of the drug. Talk with your doctor about clinical trials that may be right for you. General information about clinical trials is available from the NCI website. Chemotherapy for patients with cancer that has spread to other parts of the body or recurrent cancer that cannot be removed by surgery. A clinical trial of chemotherapy with or without targeted therapy. Clinical trials of targeted therapy, stereotactic radiosurgery, or hyperfractionated radiation therapy given at the same time as chemotherapy. This PDQ cancer information summary has current information about the treatment of oropharyngeal cancer. It is meant to inform and help patients, families, and caregivers. It does not give formal guidelines or recommendations for making decisions about health care.